Tioga Road cuts across Yosemite just north of Yosemite Valley from the Big Oak Flat entrance in the West to Lee Vining in the East. Thankfully the road had re-opened at noon the day before we wanted to drive it. Otherwise we would have been faced with a 5 hour detour and would have missed outon some beautiful scenery. But the first part of the journey felt a little scary, although open there was a 20 mile section that went quite close to the area where the forest firefighters had burnt fire-breaks. At the start of this section there was a small line of cars, a ranger speaking to every driver before they continued. "There are still active firefighters working in this section. There is a strict speed limit of 25mph, absolutely no stopping. You will know when you leave this section as there will be another ranger at the other end." Whilst we were being told this there were a few bits of ash dropping on us! Sadly many acres of woodland had been burnt in the fire, yet it was hard to see much of the burnt areas from the Tioga Road. You could see signs of burning at the top of some trees and at one point glimpse the opposite hillside that was blackened, but that was about it. Thankfully the beauty of this area had been spared. 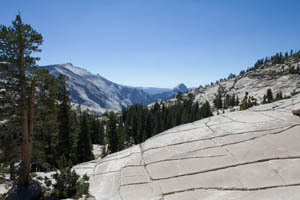 Once out of the restricted area we stopped at Olmsted Point to take in some more stunning Yosemite views. Then along to Tenaya Lake, the most peaceful, beautiful lake ever. I am reminded of a video I watched some years ago where a Yosemite ranger was asked by a woman tourist where to go and what to see as she only had one day in Yosemite. His response was, "Ma'am, I would go down to the river, sit down and cry." We had been in Yosemite for just three days and yet I still felt like crying that we had to leave. 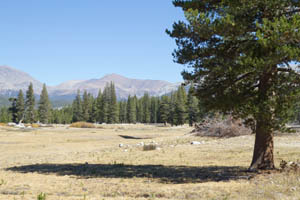 Our final stop along the Tioga Road was at Tuolumne Meadows. Another beautiful vista and a lovely final view of the beauty that is Yosemite before we dropped down through Tioga Pass to join the US 395 at Lee Vining to continue our journey heading towards Lone Pine along the Eastern Sierras.